The Buffet was opened at 7:45 and went down a treat. 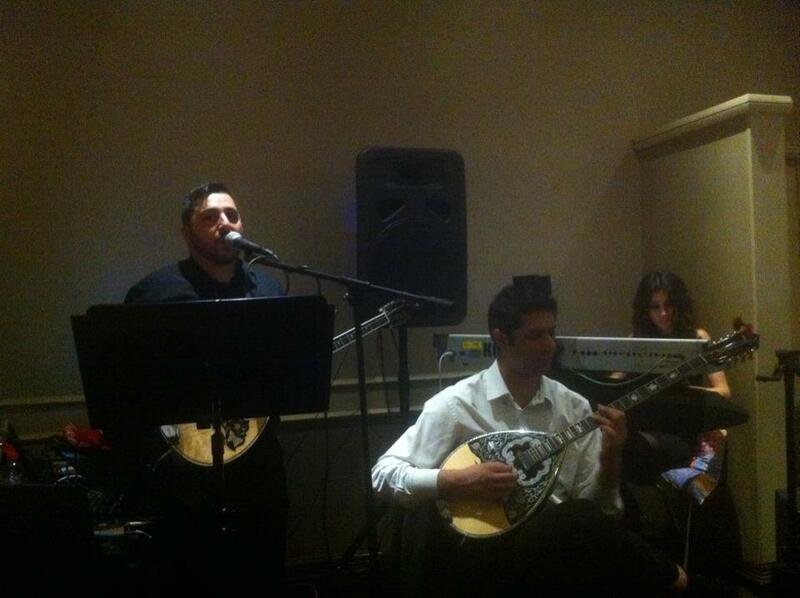 Come 10 o’clock it was time for the LIVE MUSIC from Odessey Greek Band. To warm up the crowd they started off with Their 2 Bouzouki rendition of “To Zembekiko Tis Evdokias”, followed by Hasapika and Hasaboserviko favourites like “Frankosiriani” “Matia Vourkomena” “Ena Omorfo Amaxi Me Dio Aloga” and more. This was then followed with a Kalamatiano to get the dancing Started……………. From there the party had started. Paniko, a good friend who plays Bouzouki joined in and the very popular Dimitris Kitsios came up and sang some favourite classics. Odessey Greek Band then took over and got everyone dancing to both Modern and Old favourites. There was Sirtous, Tsiftetelia, Zeimbekika and more. The party went on till 1am and people did not want to leave. Due to their popularity, the Odessey Greek Band will be back for a third time this Greek Easter Sunday 12 April 2015 and will be even bigger and better than before. You can see their videos from this event and others on their facebook page https://www.facebook.com/OdesseyGreekBand , their Youtube Channel https://www.youtube.com/channel/UCCyheyHyDordQbyhcLfzaDQ and you can follow them on Twitter @odesseyband. Look forward to seeing you all again!!!!!!!!! This entry was posted on Monday, October 27th, 2014 at 10:22 am	and tagged with Dimitris Kitsios, Greek Band, Odessey Greek Band and posted in Blogs. You can follow any responses to this entry through the RSS 2.0 feed.